"Immediately before the travellers the widest of these glens opened like a long gulf among the hills. Far inward they glimpsed a tumbled mountain-mass with one tall peak; at the mouth of the vale there stood like a sentinel a lonely height. About its feet there flowed, as a thread of silver, the stream that issued from the dale; upon its brow they caught, still far away, a glint in the rising sun, a glimmer of gold." 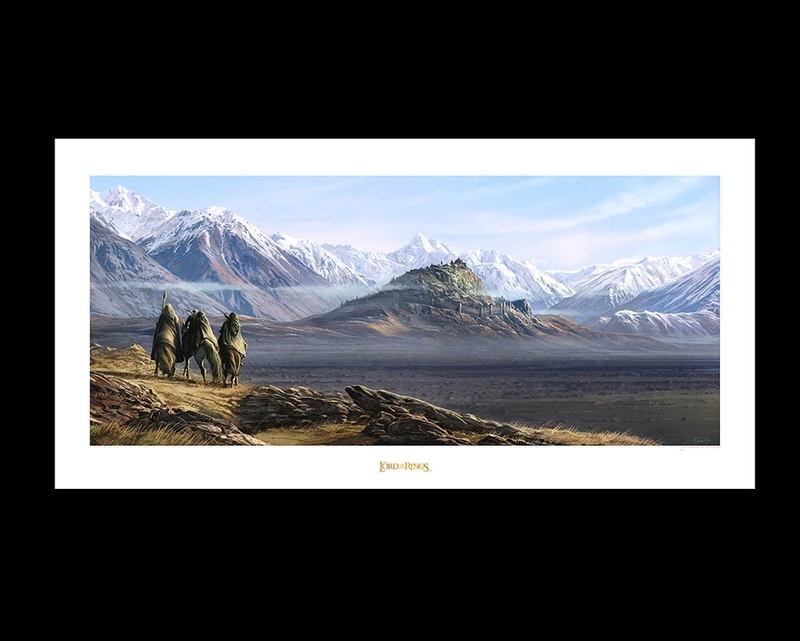 Gandalf, Aragorn, Legolas and Gimli catch their first glimpse of Edoras as the rays of the morning sun lick the thatched roof of Meduseld, The Golden Hall of King Théoden. The moment has been expertly captured by Gus Hunter: longtime Weta Workshop conceptual designer who started on The Lord Of The Rings trilogy alongside Jeremy Bennett and was an early adopter of the digital painting techniques Weta uses today. The external dimensions of the print are 23.2in x 11.7in (590mm x 297mm) and the printed area is 20.9in x 8.9in (530mm x 235mm). A lovely cinematic format. Exactly the same size as the previously released prints.